I'm knitting a cardigan so I can go out without feeling badly dressed. I'll write about them when I do my fiber study, but I asure you they are very interesting sheep. The lambs are born black and turn into a lovely gray when they grow up. My friend Tini in Germany has started a podcast about knitting, spinning, books, cooking, twins! The introduction episode is out: Twinneedle or if you prefere, in iTunes here: Twinneedle in iTunes Tini's voice is great! I liked this first episode very much, it'll be exciting to listen to what she'll talk about next. Her English is perfect. Sunday was one of those days when everything was just perfect. 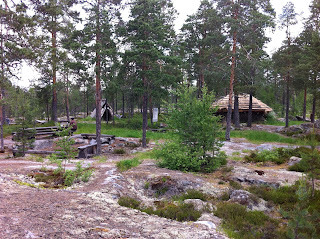 Hubby, the dog and I went to the Bronze Age buildings in Vitmossen. We only planned to have a cup of coffee and sandwiches, but suddenly we found ourselves taking the long route up to the old graves and settlements. This photo is from earlier in the summer. The two houses have been built by enthusiastic amateur archaeologists from Vörå, the community where the Bronze Age is well represented. There are stony parts, wet parts, easier parts, but on the whole it's not an easy walk in the park. Hope you like watching hubby from behind... I'm walking behind because the dog gets crazy if he has to walk behind me, and I have the camera to take care of so hubby takes the dog. Kasper has to be in leash all the time, because if he runs after game like hares or moose outside the hunting season he may be shot by bird hunters. There is no guarantee at all that Kasper will listen to us if he sees a hare. The vegetation on the solid rock is very vulnerable. It will take years and years for the lichen to come back. Finns in general are careful when walking in nature, so there is not much damage done to the plants, moss and lichen around the path. This is one of the easy parts to walk, astonishingly beautiful. So what did I pick? I always bring home something from the wood, mostly something you can eat. But not this time. Don't eat these, whatever you do. You will most certainly get very ill, maybe die. So why did I pick them? I didn't even dare to eat the lingonberries after touching the mushrooms. You can never be too precautious with mushrooms. These are Cortinarius Sanguineus, Bloodred Webcap, and Cortinarius Semisanguineus, Surprise Webcap. I used the mushrooms for dyeing. This was my first attempt ever to dye with mushrooms, and I didn't know you have to put these particular mushrooms in the freezer first, so I didn't get the red color you are able to if you do this properly. But I got a very nice color from the first bath, and a lighter one from the second bath. Det är färgat med blodspindling, Cortinarius sanguineus . Jag hittar inte såna svampar. Jag går nog på andra ställen antar jag. Jag söker ju mest ätliga svampar, fast jag tittar gärna på andra också. Skinnet kändes fasligt varmt när man lade handen på det. Säljaren berättade att man förr gjorde byxor av sådana getskinn. Det måste ha varit fruktansvärt varmt. En holländare hade berättat för henne att männen gick och kliade sig på rumpan dagarna i ända. When we visited it last week the archaeologists were just finishing the excavating for this year. They didn't find anything in that spot, but they have found bone and stone items earlier. This is a fascinating place. 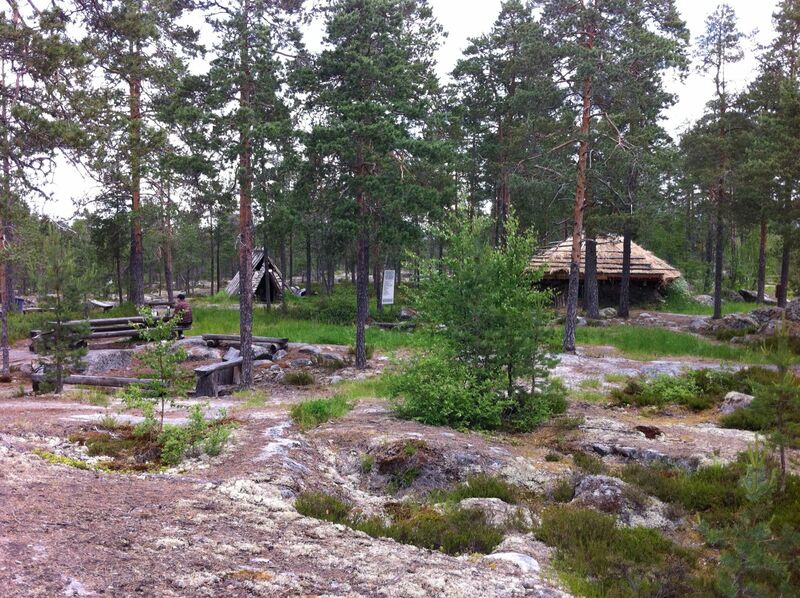 There is now a re-constructed stone age village with items made in the same way as thousands of years ago. You need a whole day, maybe two, to see the whole area. I show only one photo from the hunting area, the bird trap that looks like a cage. There are traps for most of the game there was during the stone age in northern Ostrobotnia. When hubby and I traveled in northern Finland last week we visited the Hannu Hautala Gallery in Kuusamo: Hannu Hautala Gallery. Hannu Hautala is one of Finland's most nenowed nature photographers with a long and successful career. This was the first time I've seen his photographs in real life. It was impressive, both the photos and the gallery. Hannu is the nestor of Finnish nature photography, and I think all Finns taking pics outdoors have learned something from him. He has frequently shown his work on TV, and as we are a reading nation, we have seen at least some of his many books. The light in the gallery was excellent, as you can expect from a gallery built for showing photos. Hannu collects owly items, I liked the sea shell owl and it's babies. In the showroom you can see some of Hannus best photos in a large scale, and listen to him telling the story of his life. There is also a big light board with Hannu's photos. Upstairs is a play room for children. There is a café and a shop, and changing exhibitions. If you want to look at Hannu's photos, please use the link above. Hubby, me and the dog went for a short trip to Lapland. I'll show you some photos. Installation in a field in Suomussalmi: Hiljainen kansa - The Silent People by dancer, choreographer and performance artist Reijo Kela. The Silent People will be dressed in winter clothes in the autumn. The sunsets where very beautiful. We had a sunny weather most of the time, there were no midges or mosquitos, and the trees, bushes and under vegetation was turning into all the colors you can imagine. Kuusamo is a landscape with lots of possibilities for fishing. We didn't fish, but I want to show a small part of one of the walls in a wild life shop, Kuusamon Uistin. I LOVE wild life shops! As usual there were reindeer on the roads. They wander about this time of the year, soon the mating season will begin. This seems to be a family. Pentik is a place I recommend very strongly. Anu Pentik who started the business has succeeded in engaging very talented ceramicists beside being a very good one herself. Together with her husband she has built a culture centre called Pentik-Mäki with studio, gallery, three museums and a wonderful shop in Posio, a small community in southern Lapland. Pentik have shops all over Finland and a few in Sweden and Norway. From their netshop they ship all over the world. And an interesting thing: a frame for quilting. I remember my grandma had one of these. To the right is a typical Finnish loom from earlier years. We went hiking in Oulanga Nature Park. The kind staff has built very nice roads in the park, and you may take the dog for a walk too. A small rowan had dressed up in nice colors. I love rowans, it's one of "my" trees. Later in the autumn it will be a strong orange, but I think this mild color is so tender and beautiful. The last photo shows a shy goat in our last overnight place, an old school where a young couple lives on the ground floor and lets rooms in the rest of the building. Cheap, clean, a big bedroom and a huge bath room, our own kitchen. Horses, cats and a few goats. Not far away from many of the places we want to visit, so we'll come back.